It’s been a while since my Korea trip, but I have thought about posting this for quite a while. Spending most of our time Seoul, my wife and I naturally did our fair share of shopping. Korean fashion, as cool as it is, can be pretty out there so I knew I wasn’t going to be getting much clothing. Because of this, I spent my time browsing the cute gift shops and hipster stores while my wife browsed rack after rack of blouses, pants and dresses. It was in these small gift shops that I started to run into these amazing little Iron Man suits everywhere. I would find them in small train station shops and at outdoor vendors, but assumed that they were all cheap knockoffs. Near the end of the trip I realized that outside of the amazing food, I hadn’t actually bought much for myself, so I decided to buy one of the Iron Man suits. But you can’t have just one right? These suits became an obsession for me. I would compare prices from place to place, making mental notes on what figures I wanted and how much I could get them for. I went online with the hotel wifi and found out the line of suits was by Kids Nation, a company running out of Hong Kong. I was told Korea was a haggling culture, so I naturally paid a bit more for the first couple of suits before I got an idea of how much they were worth. By the end of the trip I had nine of these things. After getting home, I found out a new release of these figures were being made for the new Avengers: Age of Ultron movie that included an incredible Hulk Buster suit. It was a huge debate in my brain for over a month before I cracked and picked up the newly released figures complete with import costs. The figures are called ‘ear pluggies’ because they come with an attachment that lets you to hang the figures off of your phone by the earphone jack, but I can’t imagine actually doing this. 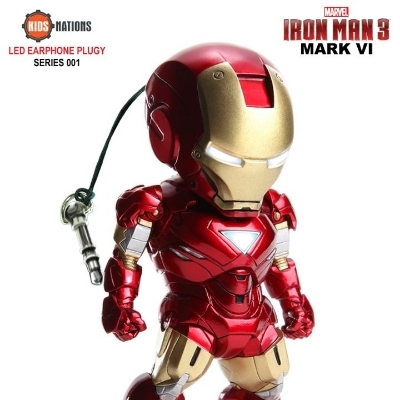 The figures are pretty detailed and are designed after the various suits seen in the Iron Man movie franchise, including the very first suit built in the cave. What’s even cooler is that the figures have a small button that lights up the chest and eyes of the small suits. Because the figures are pretty hard to get in North America, they are really unique here and I am happy to have them in my collection. Also, for those interested, Kids Nation also does incredible stuff with other licensed goods and has recently gotten funded on an indiegogo campaign to create a floating DeLorean.